It’s time to gather your people. Build your business with consistently published content that attracts the people who want what you’re offering the most. Gain the clarity necessary to move your branded content forward, whether you want to establish your presence online, launch a product or expand with a new revenue stream. Includes three 1-hour calls a month and strategy documentation. This monthly content strategy package for small business is designed to nurture leads and drive organic traffic to your existing website: Email management (2 promotional emails); 2 custom blog posts a month (social posts and graphics in support of the blog post). Before you launch your next product, course, email series, make sure you’re hitting the mark with customer research that pinpoints their felt needs. I’ll conduct a survey of your audience and deliver months’ worth of actionable insights, topic ideas and an editorial calendar. I’ve launched more than 100 projects for publishing corporations, artists and entrepreneurs in the past 20 years. 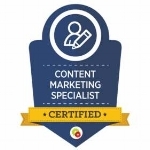 I specialize in the strategy and management of written digital content.